Today’s Cool Album of the Day (#477 in the Series) is the first Ringo Starr and his All-Starr Band. 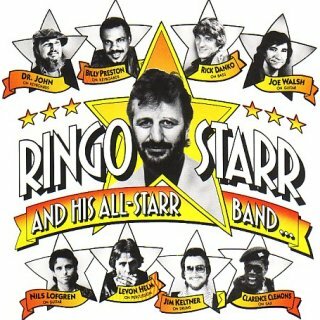 I’ve always been a huge fan of these Ringo Starr All-Starr tours. I think they are just a fantastic idea. 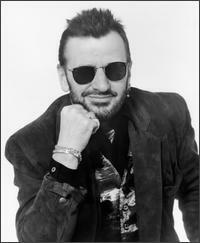 Besides being a fantastic drummer, Ringo’s a smart man. He knows he doesn’t have the body of work, vocally, to front a tour that will allow him access to large venues. So he fills out his band with well-known musicians and they take the lead also during the show. Great idea, but what makes it even better is the musicians that Mr. Starkey takes on the road with hi. He always picks some really interesting people. I don’t think many people turn down his invitations. In this version, which was the inaugural, he has Joe Walsh and Nils Lofgren on guitar, Jim Keltner, Levon Helm and Ringo’s son Zak on drums, Garth Hudson on accordion, Billy Preston and Dr. John on keys, Clarence Clemons on sax and Rick Danko on bass. In future years his bands would include the likes of Todd Rundgren, Burton Cummings, Dave Edmunds, Timothy B. Schmit, Timmy Capello, Randy Bachman, Mark Farner, John Entwistle, Peter Frampton, Jack Bruce, Eric Carmen, Roger Hodgson, Ian Hunter, Howard Jones, Gary Brooker, Greg Lake, Sheila E., John Waite, Edgar Winter, Billy Squire, Richard Page, Gary Wright and Rick Derringer. Ringo runs thru all the songs you’d expect him to play. “It Don’t Come Easy,” “The No-No Song,” ”Photograph,” “Honey Don’t,” ”You’re Sixteen.” “Yellow Submarine” and “With a Little Help From My Friends” are not on the album, however, they were performed on the tour and are included in the video playlist below. Nils Lofgren sings the great “Shine Silently.” I think he also may have done “No Mercy” at some of the shows aw well. I kinda of remember him doing that at our show, Alpine Valley. We had some pretty good seats for this show. 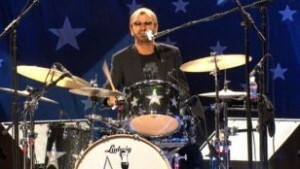 Even with all the stars on stage it was hard not to keep your eyes on Ringo. One of the things that was an unexpected highlight of the show was the little’ right aimed’ head twitch that Ringo has always done while behind the drum kit. It was a great little reminder of the watching him play with that other band of All-Stars about 25 years earlier. See more Live albums that we’ve featured. See more from 1990 that we’ve featured. See our feature on the ‘Ringo’ album.